Midtown Atlanta stands alone in the Southeast as a true urban environment, complete with spectacular parks, museums, restaurants, nightlife and housing opportunities ranging from full-service, boutique high-rise condo buildings to restored bungalows from the early 1900’s! We consider the heart of residential Midtown Atlanta to be bounded by Ponce de Leon Avenue (to the south), Monroe Drive (to the east), and West Peachtree Street (to the west). 10th Street was once considered the northern boundary, but Midtown now extends to include Piedmont Park up to about 15th Street. Piedmont Park is the geographical and cultural center of Midtown Atlanta. The park is undergoing a massive expansion project and opened this past summer (2009) with a brand new pool and lazy river. With the adjacent Atlanta Botanical Gardens, Lake Clara Meer, a dog park and biking, running and walking trails, Piedmont Park has become a place for all residents of the neighborhood to enjoy. The park also serves as a year-round event location for concerts, the Atlanta Dogwood Festival, the Gay Pride Festival, the infamous Peachtree Road Race, the Atlanta Arts Festival, and more! What makes living in Midtown Atlanta special? Before searching Midtown Atlanta homes for sale, read more about the neighborhood below! Midtown Atlanta is also home to the High Museum of Art at the Woodruff Arts Center. It hosts world class traveling exhibits and, while you’re there, be sure to see the permanent collection and the signature Richard Meier building. It has been said that Meier was chosen to build the Getty Museum in Los Angeles on the strength of the work he did for the High! Other cultural opportunities in Woodruff Arts Center include the Grammy award-winning Atlanta Symphony Orchestra (and its trailblazing conductor, Robert Spano, who also lives in the neighborhood when he’s not jetting around the world on conducting assignments), and the Alliance Theater is a great place to start checking out the Atlanta theater scene. The main stage is complemented by the smaller Hertz Stage where you’ll find the edgier productions. Atlanta’s claim to literary fame is still based after all these years on Margaret Mitchell’s Gone With the Wind. The apartment house at the corner of Peachtree and 10th in which she wrote this blockbuster was renovated in the late 90’s and is now a museum and literary center. The author talks there are well worth attending. The neighborhood’s development is closely watched and guided by a dedicated group, Midtown Alliance that has helped transform the district into a model of urban revitalization. The Atlanta Development Authority does the same for the entire in-town core growth. While Georgia Tech isn’t technically part of Midtown, its Technology Square at Spring and 5th streets is nearby. Interesting to walk around in, it represents Georgia Tech’s official foray beyond the Downtown Connector (I-75/85), it promises to be a great incubator of future technological growth. If you’re a Georgia tech student looking for a home close to campus with a vibrant cultural and nightlife scene, Midtown is a great pick! Bordering Midtown is what some neighborhood gurus have dubbed Midtown West. Atlantic Station, a nationally recognized sustainable residential and commercial development is the heart of the district. 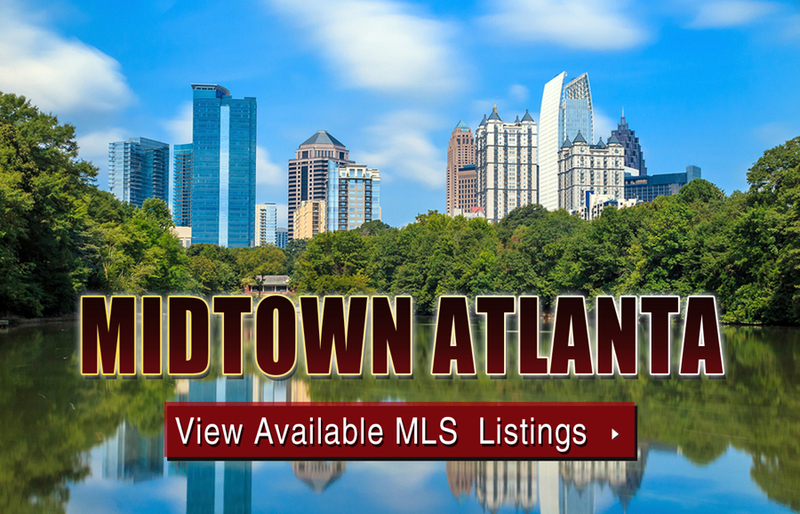 Feel free to give us a call or email us for more information about Midtown Atlanta real estate! We would be delighted to help you upgrade from your current space in Midtown, say “sayonara” to your landlord, or ditch your suburban digs and upgrade your lifestyle! Can’t find what you’re looking for in Atlanta’s Midtown neighborhood? Start browsing other Atlanta real estate for sale or give the Zac Team a call at (404) 564-7272 for help with your new home or condo search today!